Young adults are one of the largest demographics missing from our churches. Excluding large city centre congregations, those in their 20’s-30’s are simply not connecting with existing congregations and those who are, represent a small minority which can also be very lonely and less likely to grow. The young adults at St Paul’s Widnes may have been small in number but they didn’t let this stop them from doing something about connecting with this missing generation. 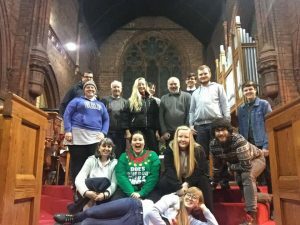 A couple of years ago they started a young adults group in Wetherspoons for other local Christians and now they’re a missional community who are praying and worshipping together and exploring how to connect with their peers and tell them about Jesus. The young adults at St Paul’s Widnes may have been small in number but they didn’t let this stop them from doing something about connecting with this missing generation. With two representatives from St Paul’s and a couple of others from different churches nearby, this small group of Christians started by meeting once a week in Wetherspoons for a meal, drinks and a Bible study. With this informal approach and the opportunity to talk about faith with people at a similar life-stage, this group began to grow through invitations and Facebook. Encouraged by this growth, the group decided to multiply into two groups meeting on different nights of the week. This led to the newer group hosting an Alpha course in Wetherspoons which led to further growth. 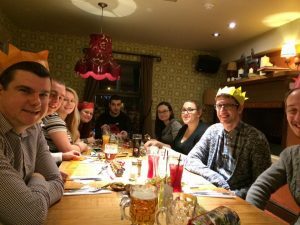 Whilst meeting in the pub had a lot of benefits, it became difficult to take the level of discipleship deeper, it was awkward to pray in a noisy pub as well as the expense of buying food and drinks every week. It was clear that God was at work and as He brought more people to ‘St Paul’s at ‘Spoons’, the team believed they needed to embrace what was happening and take it to the next stage, but they weren’t sure what that looked like. At the same time the Joshua centre support for new congregations was announced and when St Paul’s at ‘Spoons heard about our Diocese’s vision of multiplying congregations within neighbourhoods and networks it seemed like this could be the next step that they had been searching for. This idea of a new congregation also seemed to fit within St Paul’s’ wider vision. During a fortnight of prayer inspired by the ‘Thy Kingdom Come’ global prayer initiative, the congregation at St Paul’s had asked God to show them what’s next and out of this came a vision of change and growth. The new opportunities provided through the Joshua Centre and the church’s new vision of growth and multiplication appeared to confirm that God was calling St Paul’s at ‘Spoons to become a new congregation. One of the group’s leaders Kirsty, changed her role from Associate Minister to Young Adults Minister at St Paul’s and the congregation was launched. They prayed for a vision of what a worshipping community of young adults could look like, unbound by inherited church structures they had a blank page on which to dream and pray. The first thing they did was pray. They prayed for a vision of what a worshipping community of young adults could look like, unbound by inherited church structures they had a blank page on which to dream and pray. Two of the key leaders who were also involved in leading groups in other churches felt God was calling them to focus on their work there and so they stepped away from the young adults work at St Paul’s. The loss of two core members right at the beginning of this journey was difficult and it changed the dynamic of the group. After a summer break in August and two new group members from the local college taking on leadership roles, they spent the whole of September praying, worshipping and seeking God’s guidance for what to do next. It became clear the group should transition from the pub to gathering in someone’s home. At first this vision was frustrating because it was so normal, but quickly more people committed to coming every week and they felt freer to pray, worship and share prophetic words. At these midweek gatherings the group prayed for a mission focus. 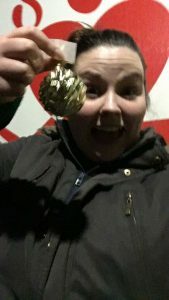 They already had a lot of favour with the local college, through previous conversations and Kirsty, the Young Adult’s Minister at St Paul’s, had also taught ethics and philosophy classes there and so they decided to invite college students to events that also had a Christian message. For Halloween they hosted a Zombie hunt, providing teams with clues and maps to help them find “severed zombie hands” followed by a gathering at the pub for food and a short talk about how Jesus is better than a zombie, following its success they then organised a Jesus treasure hunt at Christmas. With lots of musicians in the group they have also explored how to connect with the local creative community through open mic nights. Widnes is not an easy place to live but Kirsty and this small young adults’ community would love it to be known for the thriving generation of young adults who are following Jesus and transforming it into a place that is known for its hope. This journey from a community to a congregation is not straight forward and at times it can be hard to see how the vision of what could be fits into the reality of where the group are at right now. 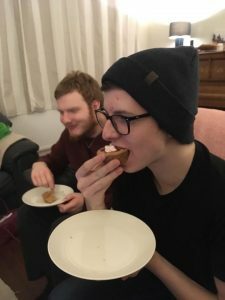 The missional events they’ve organised have been successful but the group has identified the need to have other events to invite people to afterwards to help them on this journey towards Jesus. They are still exploring other mission fields and a worship service for young adults, but are mindful of not asking people to commit to too many church activities during the week. Starting a new congregation is hard work and it requires regular commitment to gatherings as well as a commitment to the vision of the group. This challenge for commitment in places like Widnes is also affected by the reality that many of the young adults want to leave their hometown and so it’s difficult for them to take hold of the vision and imagine what the community could look like in 5 years’ time when they don’t think they’ll still be living there. The current reality in Widnes is that young adults either stay forever or plan to leave as soon as they can. Widnes is not an easy place to live but Kirsty and this small young adults’ community would love it to be known for the thriving generation of young adults who are following Jesus and transforming it into a place that is known for its hope.